Product prices and availability are accurate as of 2019-04-19 15:31:01 UTC and are subject to change. Any price and availability information displayed on http://www.amazon.com/ at the time of purchase will apply to the purchase of this product. Allergens, germs and odors, beware! 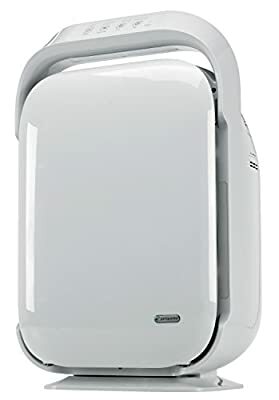 The Hi-Performance Air Purifier is an ideal purifier for allergy and asthma sufferers providing cleaner, fresher air to breathe and relief from allergy symptoms. A True HEPA filter relieves allergies by capturing 99.97% of dust and allergens as small as .3 microns in size. According to the American Academy of Pediatric Allergy and Immunology, doctors recommend HEPA air filtration to reduce exposure to indoor asthma triggers. A large activated granular carbon filter attacks common household odors including those caused by smoke, cooking and pets. And, it works to reduce the harmful VOC's that are emitted by common household products and cleaning chemicals. UV-C light technology kills germs including staph, influenza and rhinovirus. An ionizer option is built into the unit and can be turned on to boost allergen control. The ionizer emits negative ions that attract microscopic allergens to form larger particles that can be easily trapped by the True HEPA filter. 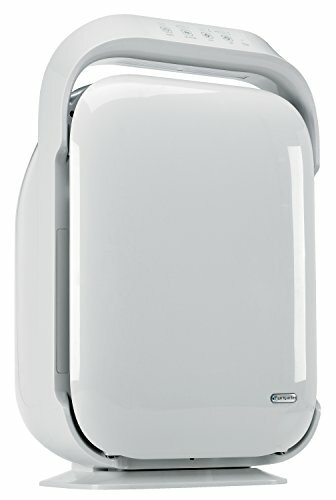 The purifiers stands about 27" high and provides powerful air cleaning in rooms up to 378 sq. feet. Tested by independent labs, the CADR ratings are high with 244 (smoke); 310 (dust) and 346 (pollen). This air cleaner is ARB certified and complies with federal ozone emissions limit.